This is one of the America’s top nut producer. They are widely grown in Texas and Georgia. Pecan’s nuts are nutritious and sweet. It can be used as a hard, beautiful wood tree highly valued for its furniture and hardwood flooring. Besides being a beautiful shade tree, it has other valuable uses. The tree is usually difficult to transplant because of the long tap root it develops. Multiple trees should be planted to ensure pollination. In open settings, the Pecans have slow to moderate growth. Pecan trees usually grow well in sunny conditions and they should be planted in well-drained, moist and loamy soils. They can do well in soil PH between 4.5 and 7.5. They can also do well in alkaline soils of New Mexico and Arizona though additional fertilization may be required. Pecan trees exhibit light brown to grayish-brown barks that have scaly ridges separated by narrow fissures. They have compound leaves that range from 12 to 20 inches in length. The number of leaflets for every leaf ranges from 9 to 17 but it will always be an odd number. They are sharply pointed at the tip and they are featured by sharply toothed margins. 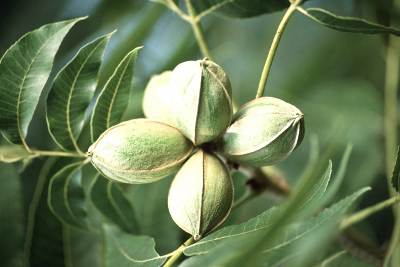 The Pecan nuts form in clusters of 3 to 12. Pecan nuts are well-contained in the dark-brown, thin-shelled husks.